The northwestern Cambodian province of Siem Reap is a model of synergy. On one hand, it’s a resort town built for tourists. Pubs, palate-friendly restaurants and cheap souvenirs abound. On the other hand, it’s a living, breathing walk through history of a powerful kingdom. Yet, neither would likely exist today without the other. As usual, I was surprised by how little I knew about our destination before arriving. During one of our days by the pool, I found a book that helped change that. Alive in the Killing Fields was written by a survivor of the Khmer Rouge era. Coincidentally, when he emigrated to America, he ended up in Oregon; first sponsored by a dentist in Salem and eventually graduating from high school in Oregon City. The South Gate of Angkor Thom, the ancient Khmer capital city. At its height in the 12th and 13th centuries, the city was believed to be home to 80,000–150,000 people. The Kingdom of Cambodia has a long, sometimes tragic history. 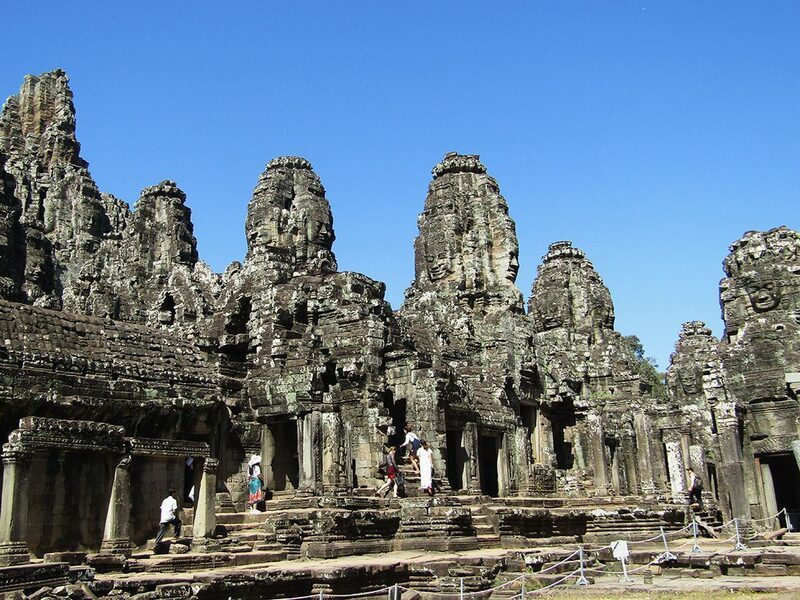 From 800-1400 A.D., Cambodia was the center of Southeast Asia. 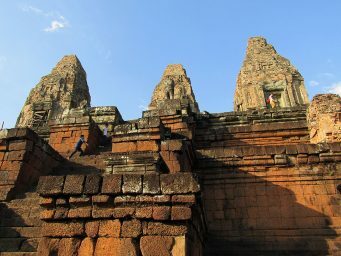 The Khmer Empire, heavily influenced by Indian and Hindu culture, literally built a large society, constructing hundreds of ornate temples dedicated to the various Hindu gods. King Jayavarman VII was the most active—Lonely Planet calls him the Donald Trump of temple building—with the construction of some of Cambodia’s most famous temples, including Ta Prohm and the ancient capital city of Angkor Thom. In the 1400s, Cambodia was overrun by the Ayutthaya Kingdom from modern-day Thailand, beginning 600 years of foreign control over the Khmer people. Under the Ayutthaya, Cambodia’s hill tribes were hunted and enslaved. In the 1800s, France began its colonization of Southeast Asia, installing governments in Thailand, Vietnam, Laos and Cambodia under the umbrella of French Indochina. French control lasted until 1953 when Cambodia re-established its independence under the young King Norodom Sihanouk. It was short-lived. In the 1960s, Cambodia allowed North Vietnam to use land to assist the Communist war effort in South Vietnam. The policy was unpopular among the people and eventually led to U.S. bombings on Cambodian soil. A military coup in 1970 led to not only the ouster of Sihanouk, but also the rise of the Khmer Rouge and the darkest period in Cambodia’s history. For nearly two decades, the brutal Khmer Rouge, led by former military leader Pol Pot, forced Cambodians into slave labor under the guise of Communism. Starvation was rampant. 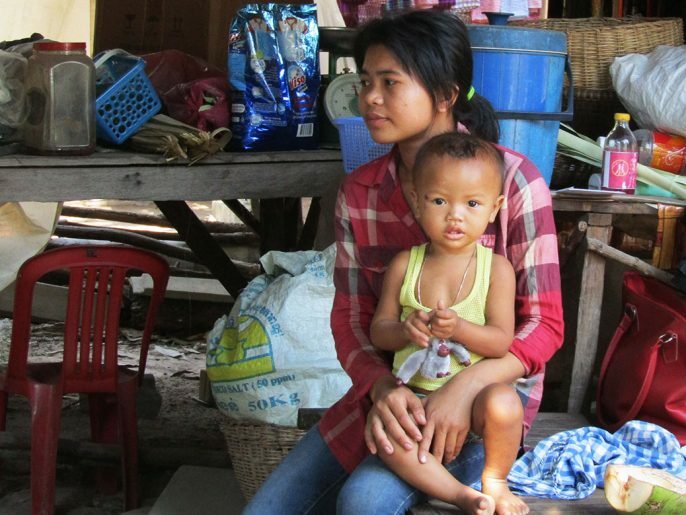 The Khmer Rogue killed indiscriminately—men, women, children—often for no reason. The worst of it occurred in 1979-80 when more than 300,000 Cambodians died of starvation. In all, an estimated 1.7 million Cambodians died under the reign of the Khmer Rouge, approximately 21 percent of the country’s population. In 1978, the North Vietnamese liberated Cambodia, installing a government that combined Hanoi’s Communist government with less-extreme components of the Khmer Rogue leadership. Yet it wasn’t until Pol Pot’s death in 1998 that the country truly began to heal. Today, Cambodia is officially called a democracy, but is still dominated by the Cambodian People’s Party—the original Communist party that still maintains its Communist-style structure. Climbing the steps of Pre Rup, one of Angkor’s oldest temples. 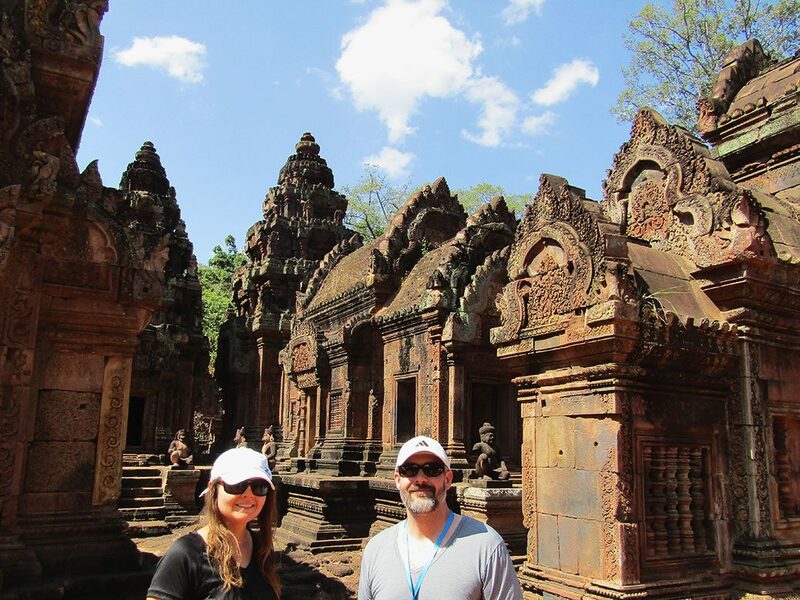 The gorgeous pink sandstone of Banteay Srei, dedicated to the Hindu god Shiva. The famous “Tomb Raider Tree” at Ta Prohm. 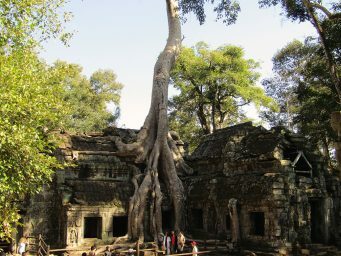 Many structures in the temple have been swallowed by the large Spung trees. Beng Mealea is one of Angkor’s most impressive temples, with a wonderful combination of ruins and decorative, naturally-intact buildings. 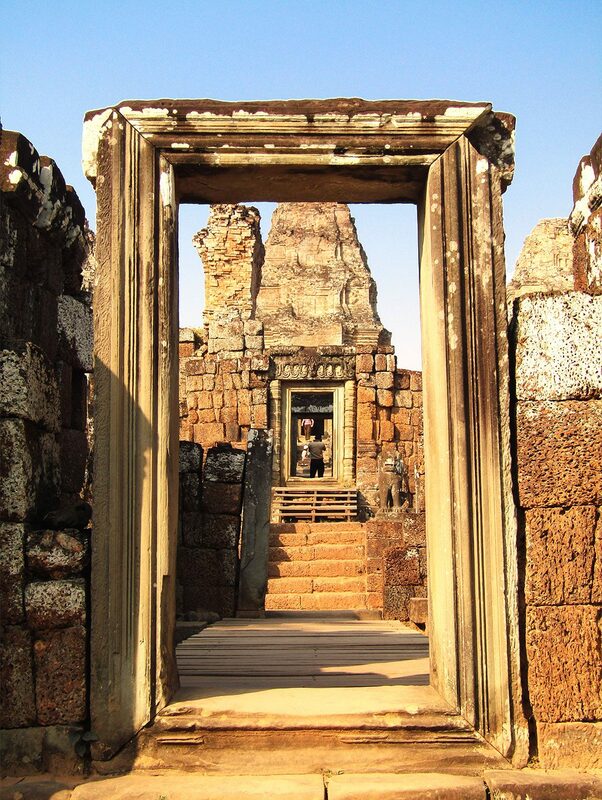 An ornate doorway stands in the ruins of East Mebon temple, offering a perfect frame for visiting photographers. Western Europeans have a long history of “discovering” things that weren’t lost in the first place. When a French explorer “discovered” Angkor Wat in the 19th century, the site was functioning as a monastery for Buddhist monks. Japanese Buddhists had been making pilgrimages to Angkor since the 17th century—although they thought they were in India, not Cambodia. Yet, it was foreign investment and restoration efforts that brought the temples back to life. 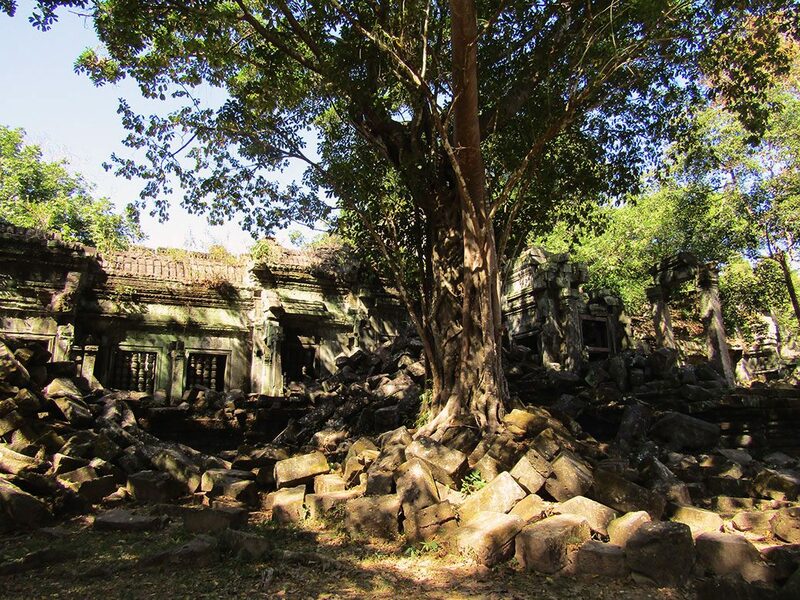 While the structures were never truly left for dead, the jungle had done its best to reclaim the temples. 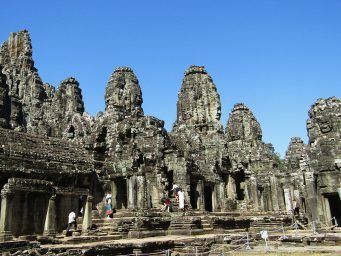 Archeologists and restoration experts made the wise choice to leave the tree roots in place, both in keeping the structures from crumbling further but also retaining the unique aesthetic quality of the temples. UNESCO’s involvement in the Angkor Archaeological Park has led to a large, multinational effort to not only restore the temples and other artifacts of the 400 km2 kingdom, but also to make the sites safe for archeologists and tourists to explore. During the Khmer Rouge’s reign of terror, landmines were buried in and around many of the ruins. In the 1990s, millions of square meters of Cambodian land were swept and cleared of landmines. But, even today, tourists are warned not to stray from marked paths. More than 40,000 Cambodians have suffered an amputation related to landmines; many of whom now work in and around the temples. Chasing authenticity in travel can be a tricky thing. 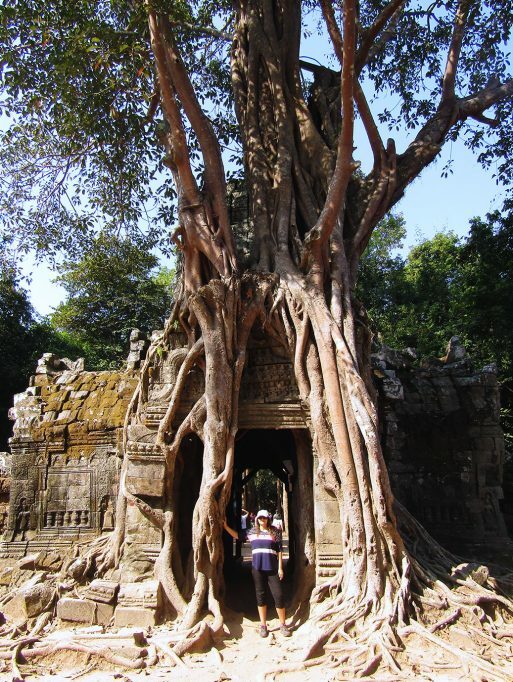 What is the “real” Siem Reap? Is it the stilted houses on the rice paddies in the countryside? Or is it the lively city center where the tourists outnumber the locals? The two million tourists that visit Siem Reap annually account for more than half of Cambodia’s total. Tourism jobs make up more than 50 percent of Siem Reap’s employment. The families who run souvenir stands on the road from Ta Prohm live directly behind their tents. We were fortunate to meet this family very briefly and learn a little about how they live. 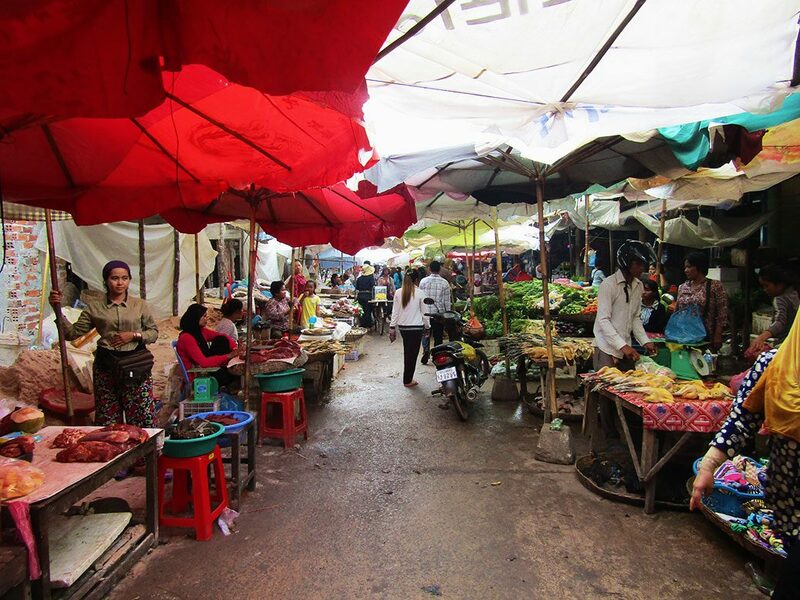 Phsar Leu, a local market located just outside our hostel on the edge of Siem Reap. 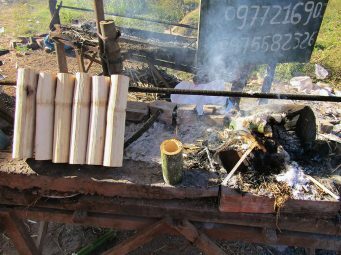 A woman at a roadside stand making krolan, a traditional Cambodian food made from sticky rice mixed with coconut, palm sugar and soybeans. 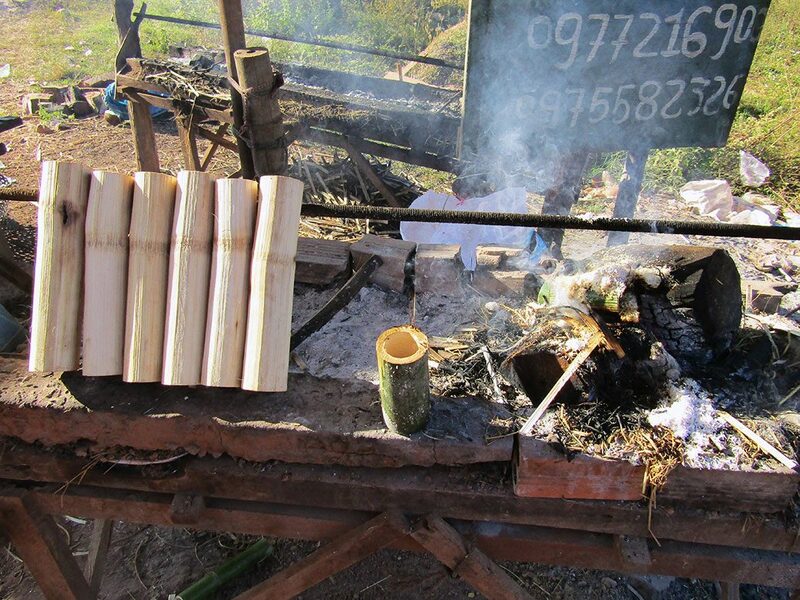 It’s stuffed into a piece of bamboo stalk, sealed off with banana leaves and roasted over a hot charcoal fire. It’s easy enough to find more local experiences. Our hostel was about 10 minutes outside the city center, next to a large indoor/outdoor market that catered to the local community. I could count on one hand the other foreigners I passed while walking through the market. Unlike the city center where foreigners are walking dollar signs, nobody seemed to care I was there, otherwise occupied with the daily business of buying and selling. Along the road to the temples, we saw several food stands meant for locals traveling the roads, things like krolan (sticky rice in a bamboo tube), fruits and vegetables. The roads to the temples were lined with vendors selling locally made products targeted at the tourists. We stopped at one such place, beating the tourist bus by a few minutes. We were allowed to see the home behind the stands and meet the family that lived and worked there. It’s those moments that are the reasons we travel. Tickets are required for most of Angkor’s temples. You can purchase a one-day, three-day or seven-day pass at the Angkor ticket office. The three-day pass, which can be used on any three days in a seven-day period, was plenty for us to see all the major temples and a few of the smaller ones. As of January 2016, the three-day pass was $40 USD per person. If you purchase your tickets after 5 p.m., you can enter the park that evening without using one of your ticket days. It’s a good way to see the sunset on the face of Angkor Wat or from the top of Phnom Bakheng or Pre Rup. 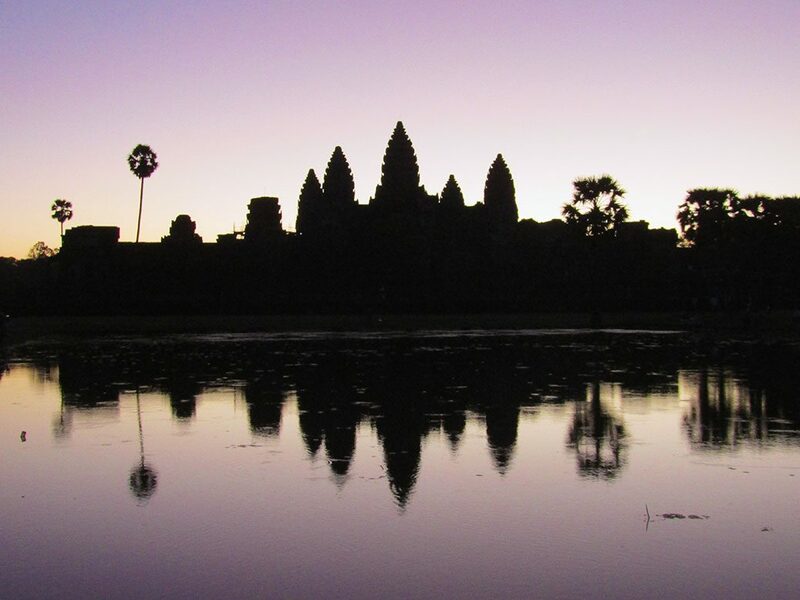 Stage 2 of the Angkor Wat sunrise. It’s worth sticking around for, plus it’s a good way to pass the time while waiting for the temple to open. The sunrise at Angkor Wat is where you get “that photo.” You have to get there early (like 5 a.m. early) to get a clear shot of temple, so you might want to arrange a tuk tuk the night before and bring a headlamp or flashlight. It’s about a 10 minute walk from the road to the ponds where you’ll watch the sunrise, so plan accordingly. In front of the crowd for sunrise at Angkor Wat. Once inside the temple complex, head for the north pond (on the left nearest the restaurants) and try to get as close to the front as possible. Then you wait. The first photo opportunity comes as the rising sun lights up the morning sky behind the temple. Wait a little while longer and the sun itself will begin to appear behind the temple’s towers. Angkor Wat doesn’t open to tourists for another hour, so take your time with the sunrise and then grab a bite to eat at one of the onsite restaurants. The big tour groups will go back to their hotels for breakfast, leaving the temple much less crowded in the morning than later in the day. If I’m being honest, the sunsets in Siem Reap are a bit overrated. If you ask the tuk tuk drivers to take you, you’ll be dropped at Phnom Bakheng. You have to hike up to the top mountain with a few hundred of your closest friends. 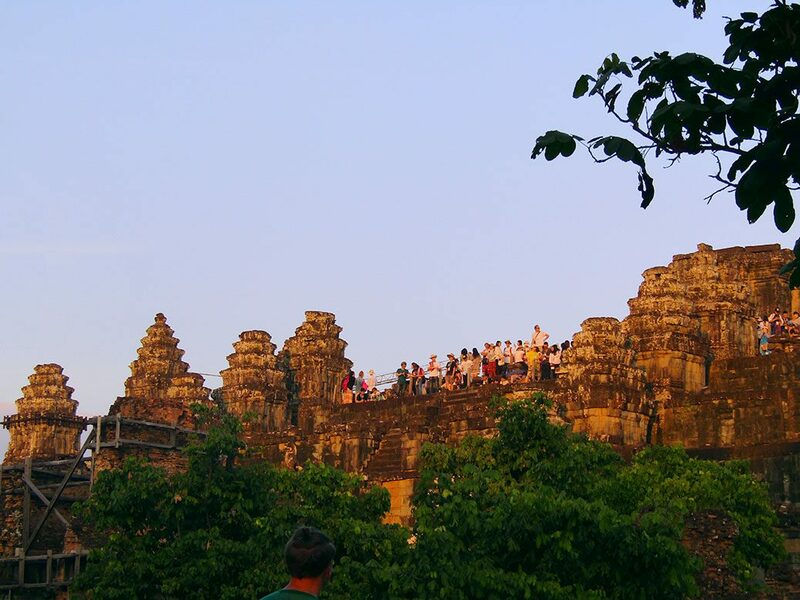 If you arrive early in the afternoon and are OK with camping out for a few hours, you can go to the top of the temple to see the sunset and catch a glimpse of Angkor Wat. 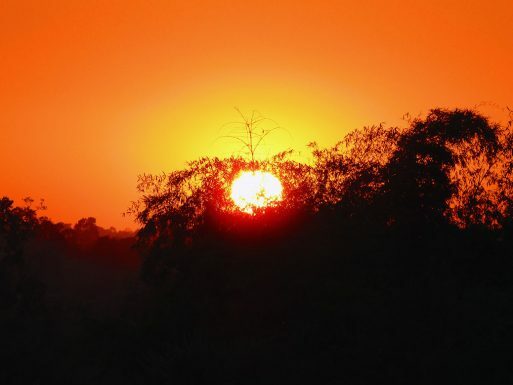 Otherwise, you’ll be squeezing in to see the sunset over the jungle through some trees. After hiking back down, you’ll have the unenviable task of finding your tuk tuk driver in the dark among the hundreds of lookalike tuk tuks. The impressive sunset at Pre Rup. The sunset at Pre Rup was much nicer. It’s still setting over the jungle, but it’s a lot less crowded and can be coupled with a late afternoon tour of the temple ruins. A free apsara dance performance at the Temple Balcony on Pub Street. Head to TripAdvisor and search for “Apsara”—the common name for traditional Cambodian dance—and you’ll find a bunch of reviews for bad buffets offering a dance performance for $10-$25 USD. Skip it and head to the Temple Balcony on Pub Street. Every night at 7:30 p.m.-ish, they offer an entertaining and free dance show that lasts about an hour. All you have to do is order some snacks or drinks. As tempting as the cushioned seats by the street are, try to sit toward the stage if you want to actually watch the show. For $10 per person, per day, you can use the pool, gym and hot/cold tubs at the Prince D’Angkor Hotel. 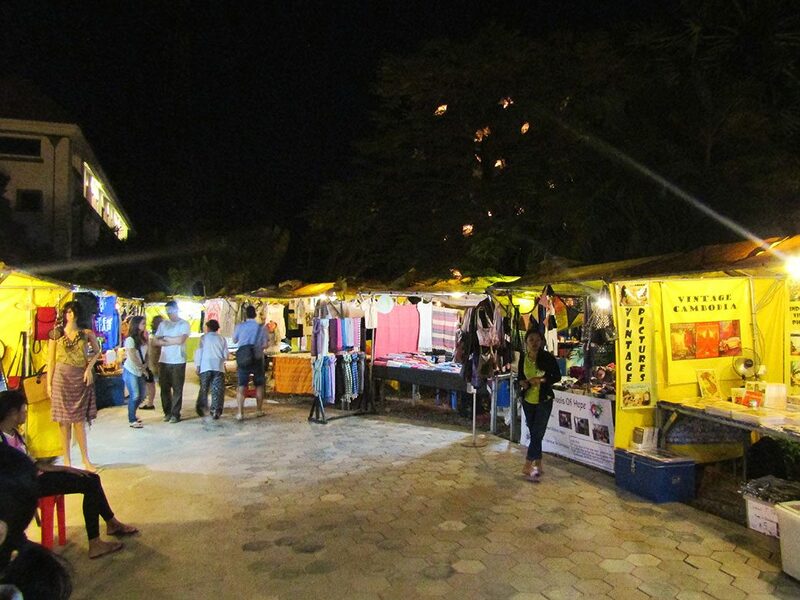 The Made in Cambodia Market is a great way to get away from the crowds and have a low-stress shopping experience. The Pumpkin Veggie Burger at HAVEN Training Restaurant. The area around the Old Market and Pub Street is packed with both Khmer food and Western alternatives. The food is OK, but we found our favorite places around the edges of the city center. Large menu with lots of Khmer food at much lower prices than in the city center. Great vegetarian menu as well. Good way to try a few local specialties without breaking the bank. A vegetarian cafe offering Khmer food, a few Asian and Western options, a large juice menu and a small shop with locally-made products. 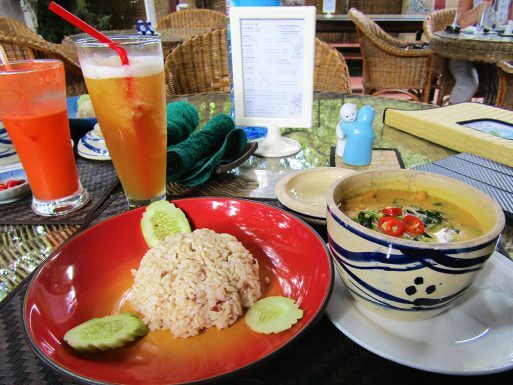 The amok was my favorite of any we tried in Siem Reap—and we tried a lot! They also have cooking classes and yoga classes in their studio upstairs. Note: The current location is on River Road. One tuk tuk driver took us to the old location, which happens to be across the street from another vegetarian restaurant, Banlle. A few minutes east of the city center across the river is Haven, a training restaurant for “vulnerable young adults” run by a Swiss couple who genuinely cares about both their employees and the quality of the food they put out. 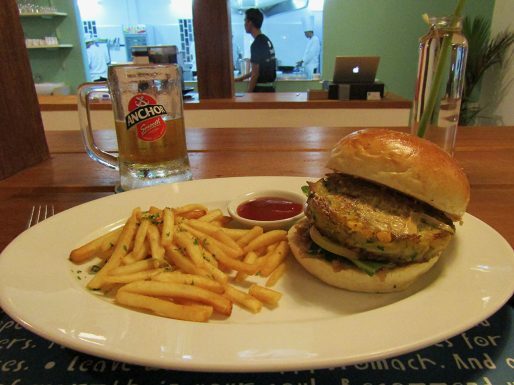 The menu is an eccentric mix of Khmer specialties, Western food and a few Swiss classics. While not exclusively vegetarian, the owner is vegan and the menu is clearly marked with veg options. The vegetarian amok was excellent and the pumpkin veggie burger was both unique and delicious. An Australian-style espresso cafe between the Provincial Hospital and Children’s Hospital. 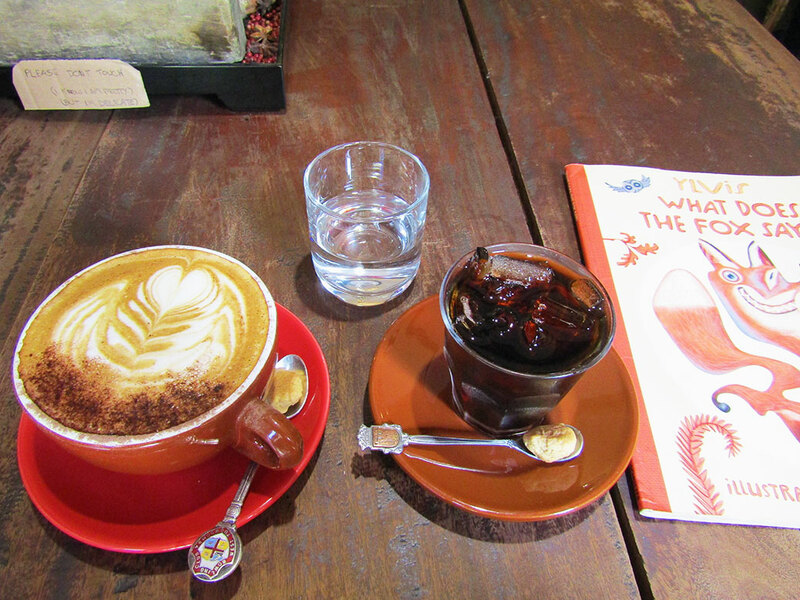 Best coffee in town, air conditioned and quiet. Small food menu as well. Housemade ice cream, sweets and more with a couple locations around town. The brownies are amazing! If you want souvenirs, but are tired of the hustlers in the Old Market, check out the Made in Cambodia Market. Held four times a week in the courtyard of the Shinta Mani Resort, it feels more like a local farmers market (minus the produce). Artisans bring their products to sell and sample (watch out for the Sombai rice wine samples… she’s generous with the pours! 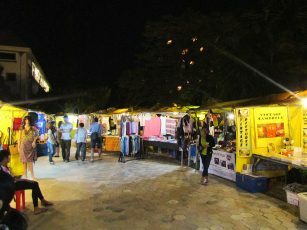 ), a few food stalls offer a quick bite and live music/dancing will provide some entertainment. Hostel doesn’t have a swimming pool? No sweat! Many of the hotels around town offer day-use of their pools for a reasonable fee. 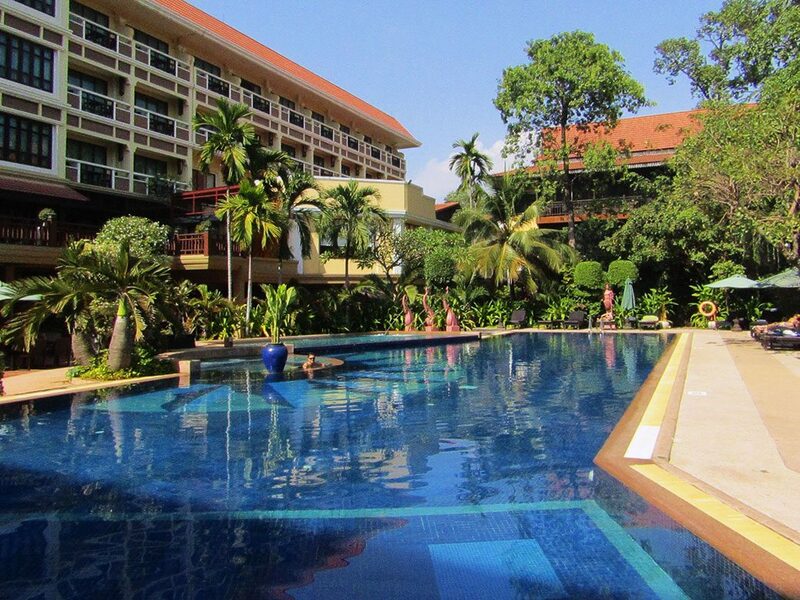 Somadevi Angkor Hotel Spa has a nice pool with a few lounge chairs and towels for $8 per person. Next door, the Prince D’Angkor Hotel provides access to the pool, fitness center, hot/cold tubs and sauna for $10 per person. Check the deck for open chairs before you pay! Seeing Hands Massage helps people from Cambodia’s blind community learn the art of shiatsu massage. The center aims to give people opportunities to earn an independent living both as masseuses and as small business owners. One hour for $7 USD and rarely a wait! Cambodia’s preferred currency is the U.S. dollar, although it uses local currency for change. We usually withdrawal money from ATMs when we travel vs. carrying large sums and exchanging at the airport. However, the ATMs charge a $5 service fee per transaction, so plan accordingly.